Was so amazed! how quick and easy these little roll-ups are to make. I made up a couple batches in no time at all.Bread jam rolls has been always one of my favorite breakfast food items. With the kiddos being home from school on break I had the opportunity to actually take the time to make some hot breakfasts for them. 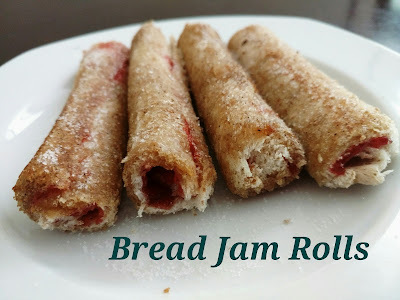 Sort of easy recipe.. slightly flattened 🍞 bread, topped with butter and any kind of fruit jam u like.. and roll and roast it.. Roll them flat with the help of rolling pin. Apply butter and jam,roll them.Seal the edges with milk. Heat a pan, smear some butter, slightly roast them..done! !